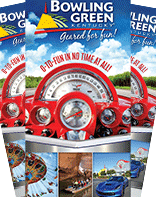 View the coupons below for discounts at popular attractions in Bowling Green, saving you several bucks off admission! Other special offers and discounts are sent during the year through the Message Center of the Visit Bowling Green app. Download it here! To learn more about area attractions and businesses offering discounts to members of the Armed Forces plus a customized Military Sites Itinerary, visit our Military Specials page.